This list is for booklets with prehistoric animals ONLY on the cover. 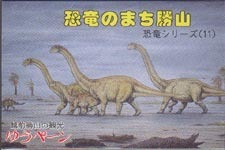 Click for the list of booklets containing prehistoric animal stamps. Institute building, Iguanodon skeleton at top left (magnified). Contents: Six different 16 Fr. stamps, insects. 6 stamps @ 50 Ø, 2 stamps @ 30 Ø, and 2 stamps @ 10 Ø. On the inside of the cover cartoon 'Stamp Joke No 11', with a sauropod, a rock mucician, and a caveman. Danish mail number H26, Michel booklet 33. 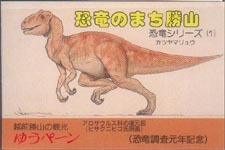 Advertisement for 'SALTO' magazine with Tyrannosaurus head. and 2 stamps @ 100 Pf. 13 numbered booklets, 12 with ten 62 Yen stamps, 1 with ten 80 Yen stamps. Numbers 1-4 as shown above left, numbers 5-8 similar but with blue background. Numbers 9-10 without the orange bar at the bottom and a lilac-grey background. Numbers 12-13 with diorama's, as above right. Contents: 10 self-adhesive stamps @ 2,50 Dh with different birds. 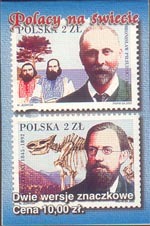 Two stamps, the bottom one with a portrait of palaeontologist J. Czersky and a skeleton of Coelodonta antiquitatis. 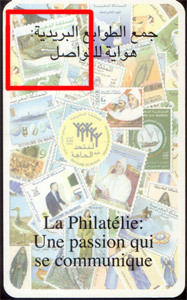 Contents: 5 stamps @ 2 Zl., as the top one on the cover. Animal outlines at left, including Triceratops. Lottery, with a trip to Disneyland to be won. Is this a winning booklet? Contents: 10 'Machin' stamps for first class mail.